It has been HOT and muggy here in Orange County. It’s always right about now that I really start to crave fall weather. I love cooking (and eating) soups, stews, and chiles all throughout fall and winter. One pot meals are my favorite! But alas…the forecast tells me that it will be in the 80’s and 90’s for the next few days :(. I will patiently wait for fall weather, and in the meantime make a few more warm weather meals like this one. I made some tzatziki and hummus, but you could buy those at the market if you want to get this on the table even quicker. 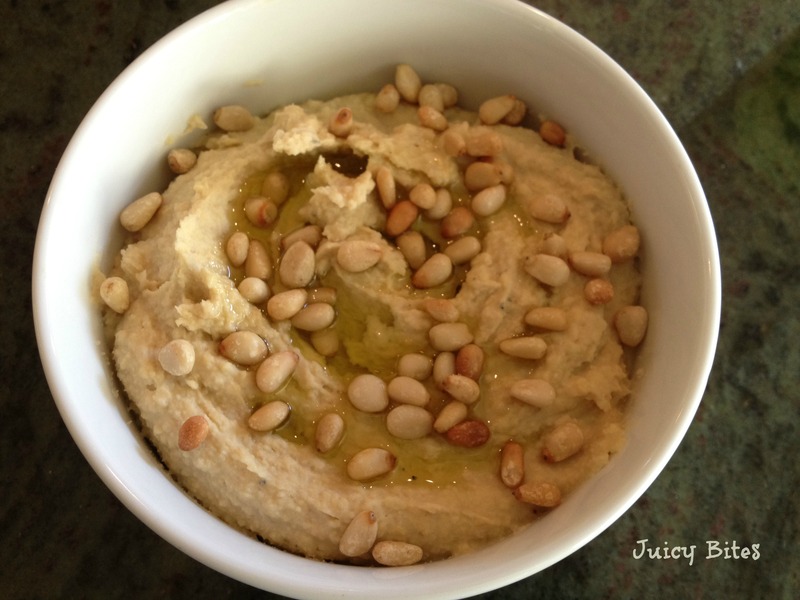 If you want to make them from scratch (home made ALWAYS tastes better than the store bought stuff), you can use this recipe for hummus. 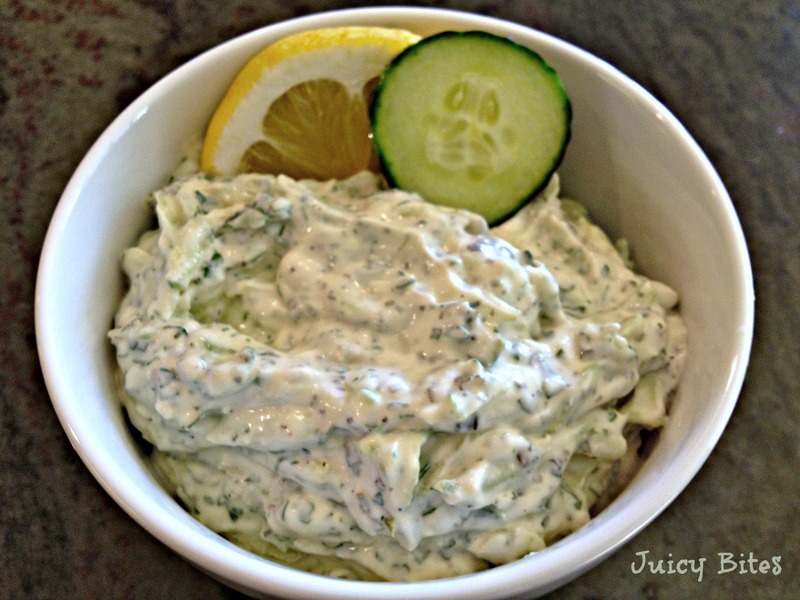 For the tzatziki, I use this recipe from the Barefoot Contessa. The only changes I make to her tzatziki is that I don’t use the sour cream…I don’t think it really needs it, and I don’t bother to strain the yogurt. If you are not a fan of smoked salmon, you could substitute some good roast chicken breast from the deli. 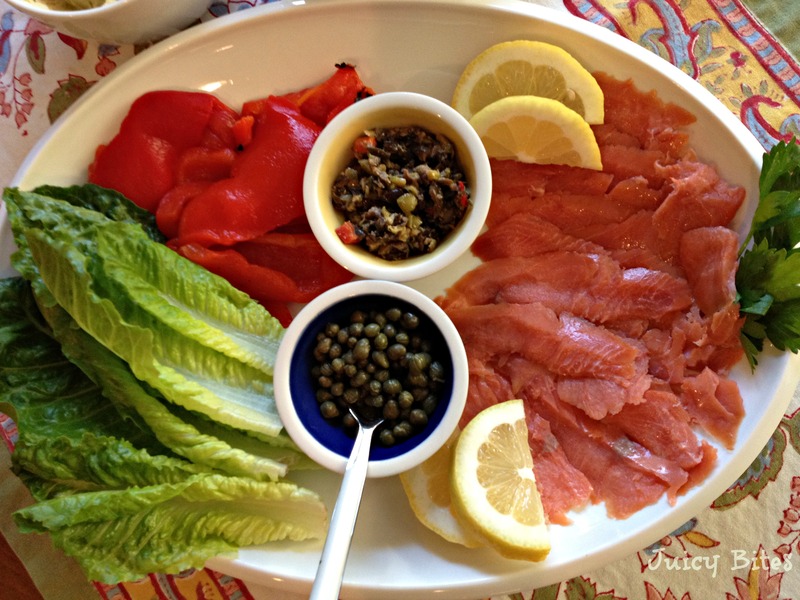 If you do use smoked salmon or lox, try to find wild salmon. It really does taste better than farm raised salmon. I love that this dinner doesn’t involve using the stove or the oven! 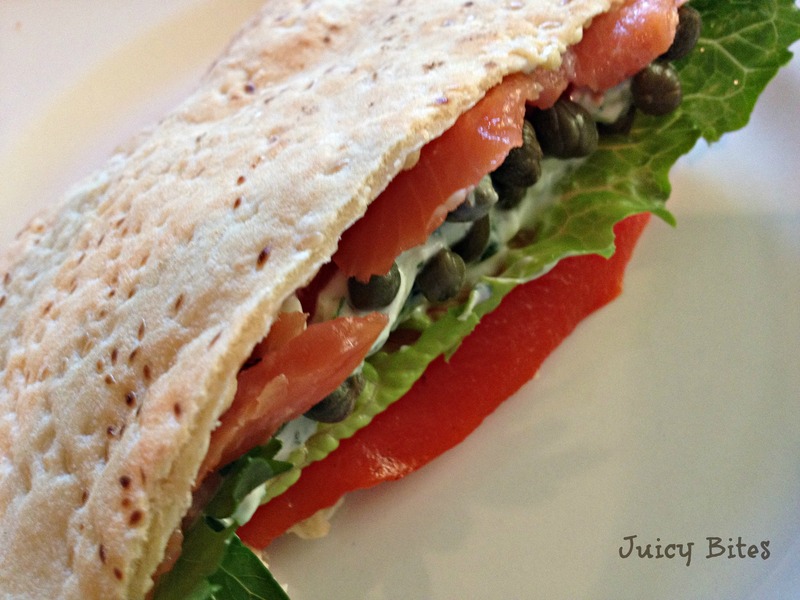 I used pitas, but this would be great in a wrap also. I always have a jar of roasted red peppers in my pantry. They are great to dress up a sandwich. 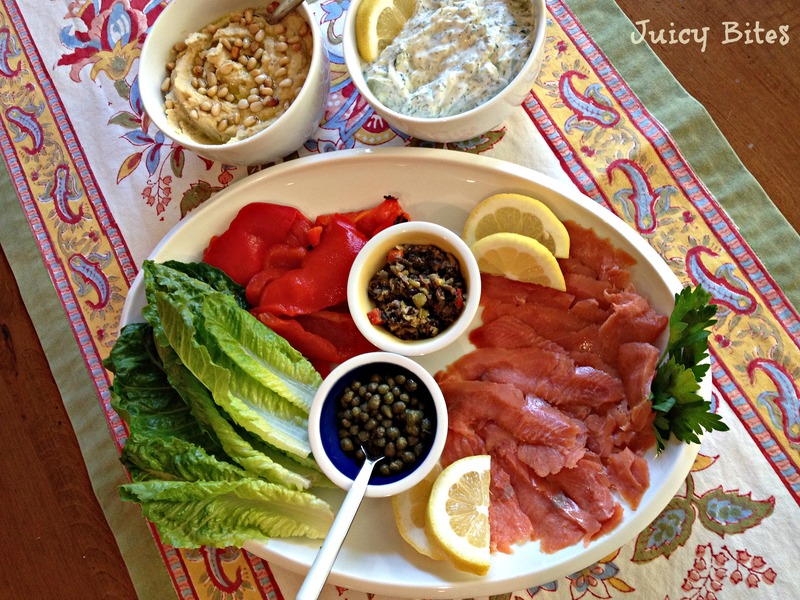 The capers and olive tapenade are delicious additions too. Arrange all of your ingredients on a platter. Toast your pitas if desired. 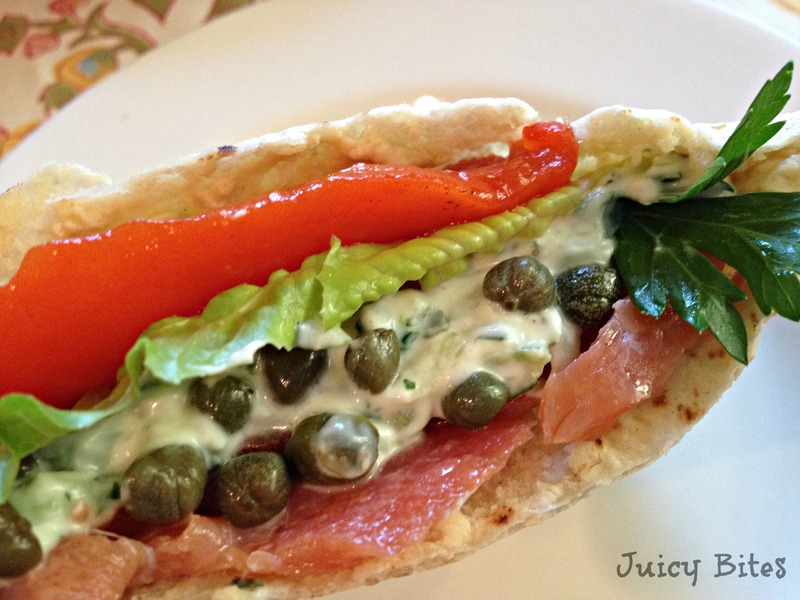 Let family (or friends) stuff their own pitas according to their taste. This is a great idea!!! 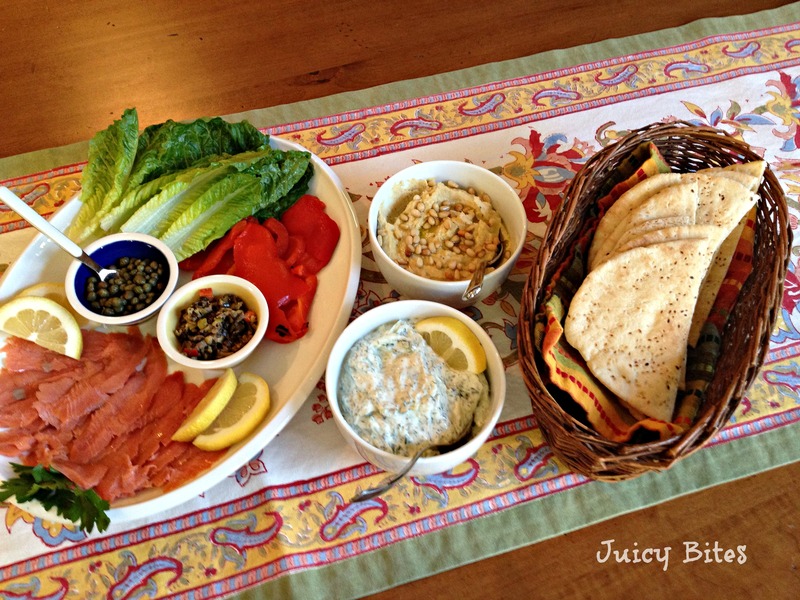 I love smoked salmon but I’ve always been afraid to buy it at the store (I don’t know why)… Where do you get yours? Thanks Danielle! Funny…I actually have kind of a love/hate relationship with smoked salmon. There are some that are kind of fishy and not so good. This one was actually from Gelson’s in Dana Point and it was a wild smoked salmon that was really tasty. I think Trader’s has some good wild smoked salmon too.